The SANS Investigate Forensic Toolkit (SIFT) is an interesting tool created by the SANS Forensic Team and is available publicly and freely for the whole community. It comes with a set of preconfigured tools to perform computer forensic digital investigations. 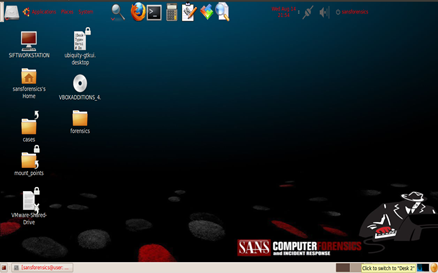 This is based on Ubuntu and has a long list of tools for present forensic needs. We will have a walkthrough of some of the very famous tools used in forensic investigations. It supports evidence formats such as raw format (.dd), encase image file format (E01), and advanced forensics format (AFF). You can simply boot the SIFT iso as a bootable disk or choose to install it as a complete operating system. The default login credentials are: username—sansforensics and password—forensics.